I’m excited to announce I’ve taken on a new position as the Technology and Computer teacher at a STEM charter school in Houston, Texas. Yesterday, I met some of my 650 elementary students and their parents. I will be teaching 2nd to 5th graders and working with our PBL teachers to support the kindergarten and 1st graders. I’m excited to begin the school year and already have a checklist of what needs to be accomplished before we officially begin on August 22nd. I’ve included these tips below along with slide presentations, posts, and tons of resources. I hope these ideas and resources help you plan for an incredible year ahead! Encourage students to set academic and personal learning goals so they envision their success and come up with strategies to achieve goals! Check out my post, Back to School Student Goal-Setting and Motivation with Digital Vision Boards. Keep them focused on their goals and get them to check on the progress of their goals regularly with digital portfolios. Find my free Google Slide template and examples here. Students learn on the first day we are not just a classroom, but a community! For all grades we gather in a circle and talk about the importance of communities and how our actions impact the rest of the community, our physical classroom community as well as online communities, the World Wide Web. Check out my presentation, Community Building with Get to Know You Activities & Icebreakers. Use icebreakers and get-to-know you activities to cultivate relationships, teach digital citizenship, promote active learning and get students to know each other. Find tons of icebreakers I’ve created here. These are icebreakers specifically for young learners and children. These are icebreakers for teens and adults. Cultivate relationships! Learn students’ names and help students learn their peers’ names with the ideas in this post. You can use my free Buncee Student Class Name Dictionary template here. Quickly assign students this editable template, then stitch the slides to add to the original Name Dictionary. This takes just a few minutes to do all this. Another option is to use my Google slide template and have students add their own slide. Classroom management is easier when students come up with the rules for their communities and commit to following them, because they understand these rules help their peers and them thrive. Check out this webinar recording and post with ideas and resources. Revamp your syllabus so students actually know the important information shared. Make your syllabus more interactive and engaging with these ideas. Animate your textbook and make it more engaging and hands-on with the ideas shared here. Create a teacher survival kit so that you are more flexible and prepared when the unexpected occurs, which happens often throughout the year! Discover how bell ringers or lesson starters at the beginning of each class period help you and your students get mentally prepared for the learning ahead. Make your classes more accessible and culturally inclusive with tips shared here. Find lesson planning tips here. Find more tips for integrating technology here. Find ideas for managing a classroom full of devices here. Check out slides 19 through 24 in the presentation for specific tips on keeping students focused and storing devices in one area. Engage parents with these resources. Transform your classroom environment to support student-centered learning. Check out flexible classroom designs, makerspaces, learning stations, etc. What is your class theme this year? We have a superhero theme this year, since we are accomplishing missions to transform our school community and help out our peers. I tie activities, projects, the classroom design, and some of the materials to this theme. I’ll be sharing more about our theme in the future, but here’s a post with an example. 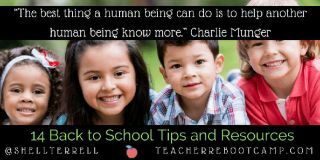 Challenge: Try any of these ideas to prepare you for the school year head. Feel free to share your tips in the comments below.